This is a scalable context timeline. 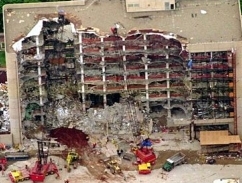 It contains events related to the event April 8, 1997: Oklahoma Gazette Publishes Letter from Accused Oklahoma City Bomber. You can narrow or broaden the context of this timeline by adjusting the zoom level. The lower the scale, the more relevant the items on average will be, while the higher the scale, the less relevant the items, on average, will be. Future Oklahoma City bomber Timothy McVeigh (see November 1991 - Summer 1992, May-September 1993 and 8:35 a.m. - 9:02 a.m. April 19, 1995) again goes to Michigan to join his Army buddy and future co-conspirator Terry Nichols (see March 24, 1988 - Late 1990, December 22 or 23, 1988, and April 2, 1992 and After). He stays with Nichols for several months, living on a farm in Decker, Michigan, owned by Nichols’s brother James Nichols (see December 22 or 23, 1988) and helping with the harvest. The two also drive around the country, buying and selling items at gun shows. Enraged by the debacle in Waco (see April 19, 1993), McVeigh and Nichols begin experimenting with explosives on James Nichols’s farm, meeting with members of the nascent Michigan Militia (see April 1994), and proposing to launch violent attacks on judges, lawyers, and police officers (see April 19, 1993 and After). McVeigh and Nichols find the militiamen too inactive for their taste. 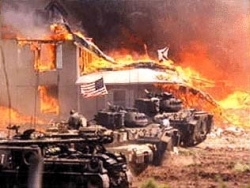 (Michigan Militia spokesmen will later claim that they ejected Nichols and his brother James from their group for their “hyperbolic language”; after the bombing, militia leader Norm Olson will say, “These people were told to leave because of that type of talk of destruction and harm and terrorism.”) Inspired by the novel The Turner Diaries (see 1978), McVeigh and Nichols form their own small “cell” (see February 1992), calling themselves the “Patriots.” (Some neighbors will later say that McVeigh and Nichols were not necessarily building “practice bombs” for later use, but merely amusing themselves—“mixtures of mainly household chemicals”—to relieve the boredom of farm work.) In October, they drive to Elohim City, a white supremacist compound in eastern Oklahoma (see 1973 and After), where they meet with at least one member of the Aryan Republican Army (see 1992 - 1995). A speeding ticket from December 1993 shows McVeigh makes multiple visits to the compound. During this time, Nichols and McVeigh go to a gun show in Arkansas, and briefly consider buying a house there, but instead they return to Michigan. Neighbors later recall that McVeigh and Nichols go to several meetings of the Michigan Militia (see January 1995). McVeigh begins using the alias “Tim Tuttle,” and begins buying nitromethane, a key ingredient in explosives, at hobby shops (see December 1993). [New York Times, 4/24/1995; New York Times, 5/4/1995; New York Times, 5/28/1995; Stickney, 1996, pp. 159; Douglas O. Linder, 2001; Nicole Nichols, 2003] During this time, McVeigh acquires a Michigan driver’s license. [New York Times, 4/23/1995] After the bombing, Elohim City leader Robert Millar will deny having any knowledge of McVeigh (see April 1993 and May 24, 1995).